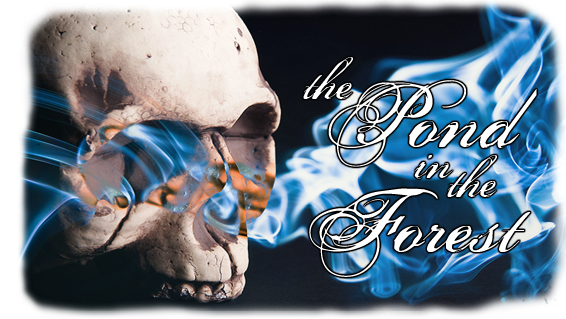 Check out my reviews of some creepy books to get you in the haunted mindset tonight! Click on the titles to see my review. 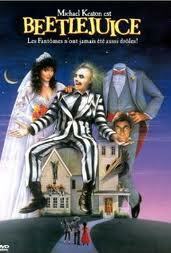 And what Halloween would be complete without some movie watching? Here are some I'll be settling in with. I might throw in some scary ones too, but meh. I like laughing more than being scared. 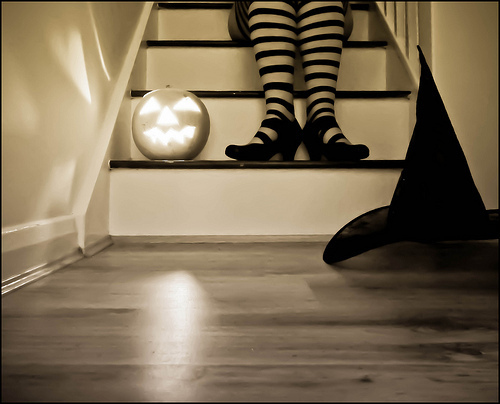 So what are all of you up to for Halloween? Any great costumes or movie/reading marathons? What scary stories do you love to read this time of year? Juliette hasn't touched anyone in exactly 264 days. The last time she did, it was an accident, but The Reestablishment locked her up for murder. No one knows why Juliette's touch is fatal. As long as she doesn't hurt anyone else, no one really cares. The world is too busy crumbling to pieces to pay attention to a 17-year-old girl. Diseases are destroying the population, food is hard to find, birds don't fly anymore, and the clouds are the wrong color. The Reestablishment said their way was the only way to fix things, so they threw Juliette in a cell. Now so many people are dead that the survivors are whispering war- and The Reestablishment has changed its mind. Maybe Juliette is more than a tortured soul stuffed into a poisonous body. Maybe she's exactly what they need right now. Juliette has to make a choice: Be a weapon. Or be a warrior. That's what I got this week, what did you all get? Iris just turned fourteen, but she doesn't feel any different. She tries to get her friend Colette to still play their same games, but Colette seems to have taken up in interest in boys. When Iris hears and sees a real ghost in the graveyard that says "Where y'at Iris?" she knows that their games are no longer make believe. Colette is more interested in Ben though then some silly ghost game. Ben seems plenty interested in going along though. When stranger things start to happen, Iris feels like she might be the only one not making everything up. Maybe she's going crazy, or maybe the ghost picked her for a reason and she needs to help him. This was a very, very interesting story. I never knew what was going to happen next with the ghosts. Everyone in the South seems to keep a lot of secrets, or maybe them just forget the truth from spinning the same yarn for so many years. I didn't love Iris, she seemed to be very immature one second and then the air of maturity the next. There was too much back and forth for my liking. This did seem like a coming of age tale too, but it was mostly Iris and Colette's friendship that matured instead of Iris. It was a wild read trying to guess what happened and what was real and who was lying. I definitely recommend this for reluctant and avid readers alike. The story goes quick, there is never a dull moment. It was plenty spooky too, because you never really knew what you would get with the ghosts. I was a little disappointed that the ghost's action weren't better explained. It seemed like he was all crazy for no reason, but maybe a lot of it was outside interference. Regardless, I would check this one out if I were you, it was plenty interesting. 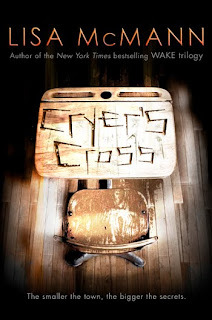 "Nothing ever happened in Ondine, Louisiana, not even the summer Elijah Landry disappeared." "The crypt's soft stone ground each time I pried, sending a nasty, bone-crunching sensation up the metal that made me want to boil my hands in bleach." Rory's parents give her the choice of staying in Louisiana for her senior year, or accompanying them to England. Not a hard choice. So she arrives in England just as the police have found a murder victim. There were no witnesses, the cameras that are everywhere caught nothing and there are no traces of evidence in the crime scene. Some are saying it's Jack the Ripper, or at least a copycat. When these murders start to follow the Ripper's pattern though, the police are still at a loss. They do have a witness now. Rory. Rory saw a man who is now the main suspect. What's weird though it that Rory's roommate was standing right next ot her and didn't seen the man at all. Rory doesn't know what to believe and what she can trust. Rippermania grips London and won't let go and Rory can only go along for the ride. If you follow Maureen Johnson on Twitter, you might think she's crazy. After reading this novel I have confirmed that her insanity is due(at least in part) to the fact that she is a genius. Seriously. This book was insanely well-written in every aspect. I never knew what was going to happen next. Maureen added so many elements that I would have never expected. The tale of Jack the Ripper is one that has fascinated many people for decades and it is a fascinating tale. There is so much unknown in the case(s) that it really leaves it open to speculation and people love to speculate. 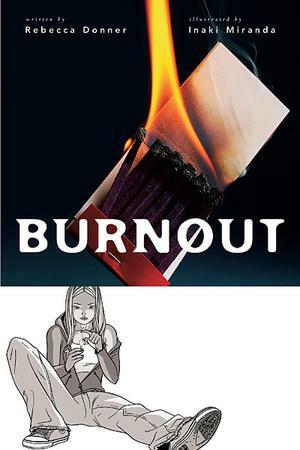 Maureen really did an amazing job with this novel and the characters. Each person was so vivid and alive(well, you know what I mean), that I never messed up who was who. Rory was completely fascinating with all her southern charm. She went from drinking sweet tea to Earl Grey and brought a slew of bizarre family stories. I loved all the extra elements of the story and how vibrant the setting was. I felt cold and miserable throughout the English drizzle, but exhilarated at the very though of London's cobblestone streets. Maureen wove a creepy tale full of spooks and old haunts. 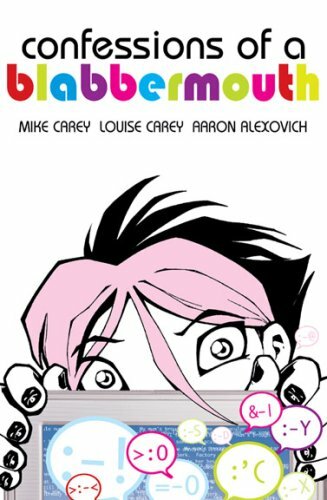 You have to pick this one up soon, it's a perfect creepy story that will leave you craving more of Rory's haunting adventures. "The eyes of London were watching Claire Jenkins." "Somewhere on the school grounds, there was a Big Rock Candy Mountain of alcohol—a magical closet filled to the ceiling." "I looked at the stained-glass image of the lamb in the window above me, but that only reminded me that lambs are famous for being led to the slaughter, or sometimes hanging out with lions in ill-advised relationships." Anya's is a Russian immigrant. One of two at her private school. All she wants to do is fit in and get a boyfriend. One day when she is walking home from school, she accidentally falls down a well. While down there she notices a skeleton and along with the bones is a ghost. When Anya gets out of the well she winds up taking the ghost, Emily, with her. The ghost helps her do quizzes and flirt with boys. 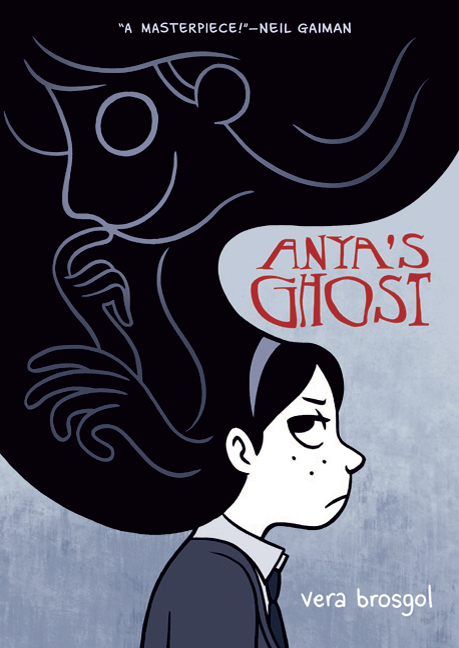 Anya does not know a whole lot about Emily and when the ghost starts getting pushy, Anya wants to find out what happened to her so she will leave. What she finds though is more than she expected and now she might be in danger. This was a fabulous story. If you have read Persepolis this is probably right up your alley. 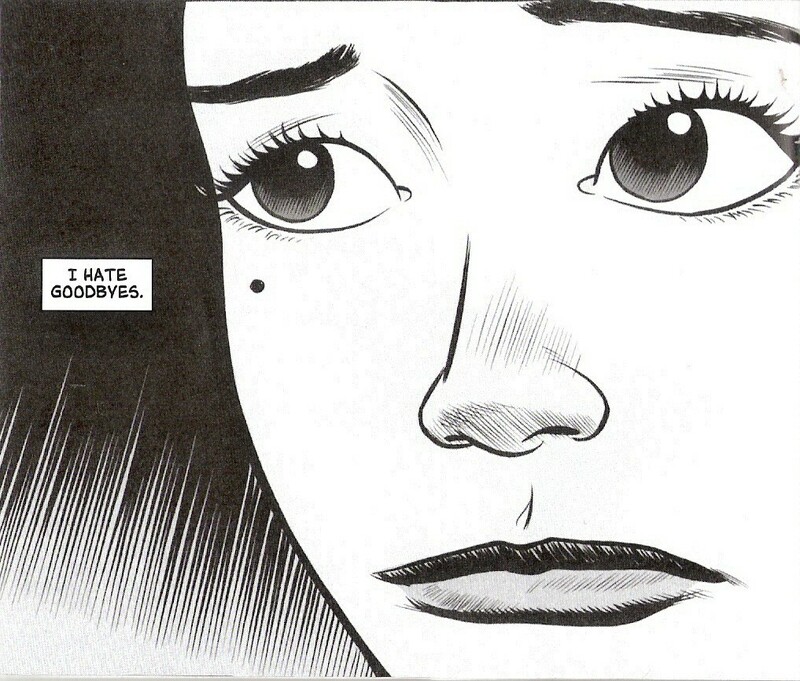 Anya is a typical teen angst-filled character, except she's an immigrant. Through years of ESL she has lost her accent and is completely fluent in English. The other Russian is not so fortunate and gets harassed everyday. This was a little eerie at times and a fantastic read. Emily was a bizarre character, which made her like-able but also really intense. The illustrations of Emily and Siobhan are a little androgynous, and if it weren't for Siobhan's name and Emily's dress (before you find out her name) I would have thought they were boys. In general I did enjoy the illustrations. This was a nice little mystery and not at all what I was expecting from this book. You should definitely pick this up if you have any inkling of desire to read it. Kendall has always lived in the small town of Cryer's Cross. Nothing much ever really happens until a girl goes missing. The whole town goes out in search of her, but they turn up nothing, not one trace of her. Everything settles down soon after, and Kendall notices a couple of new kids in school. Luckily they fill the empty seats and Kendall's OCD starts to calm down again. Then her best friend goes missing. Jacián, the new boy, is in charge of partnering up with Kendall, when the town is locking down for safety. Kendall's OCD kick into overdrive when she notices new graffiti carved into her friend's desk. Maybe it's from him, maybe she can save him. There's old tales lurking, and Kendall might just see the horrors up close and personal. What a creepy book with terrible events. This is a perfect story to make your skin crawl. Don't let the frivolous romance lead you astray, this book means business. Sure Kendall is forced to wage a war between her heart and mind, but there are bigger things lurking afoot. 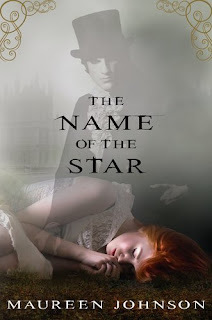 I did not love Lisa McMann's writing style, but once the book got going, I was able to push it to the back of my mind because the story was so amazing. It's crazy thinking of living in a town where the high school(4 years) boasts around 40 students. Such a small town, so you can imagine that when two kids go missing it's pretty devastating. I don't know if it was the fact that Kendall's brain was already full up with her OCD, but she seemed to easily forget the fact that two kids were missing, one of them her best friend. It was great that she could get distracted enough, but it seemed weird that she was able to leave the house. If you're looking for a creepy story to make your skin crawl a bit this Halloween, make sure you check this one out right away. "Everything changes when Tiffany Quinn disappears." "She is forever in that moment just before sleep, that sweet hovering moment where nothing else matters." The wind is lonely. The Near Witch once loved children, but unfortunate circumstances saw her cast out of Near. A stranger comes in with the wind. There are never strangers in Near. The day after the stranger arrives children start to disappear. Lexi wants to know more about the stranger, curious of someone who isn't from Near. Her uncle leads the search for the children, which may lead him to the stranger too. Lexi needs some help unraveling the mysterious and long forgotten past of Near. If she can figure out what is going on she may be able to save the children and stop history from repeating itself. This novel was pretty near perfect. If you are not a fan of fairytales though, you probably won't love it as much as I did. This wasn't a fast-paced novel, that kept your heart racing. It was a novel that slowly unveiled itself to you so that you can devour it one clue at a time. Though a lot of the story was pretty easy to assume and most of the outcomes were presented right near the beginning. One thing that did bug me is the chapter breaks. They seemed to be pretty random. Most of the time the story just continued on right into the next chapter with no gaps. I liked having a solid place to stop, but it seemed a little odd where the breaks were placed. The town of near had a The Village vibe going on about it. There was a Council and they ruled the town with fear of what could happen or what did happen long ago. Pretty strange. I loved that Lexi was a nice strong character, and that her father taught her well. Lexi was not a fool and did not automatically assume the worst in people despite how the town thought. 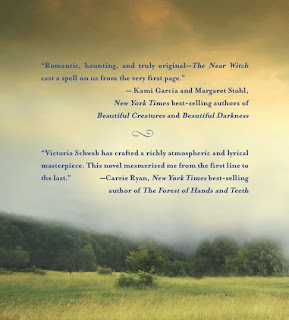 I fell in love with almost all the characters, Victoria Schwab did an amazing job capturing so much emotion in the little details. She didn't go on and on with appearance descriptions, but rather crafted their personalities. I felt like I knew each and every person; the kind of person they were. 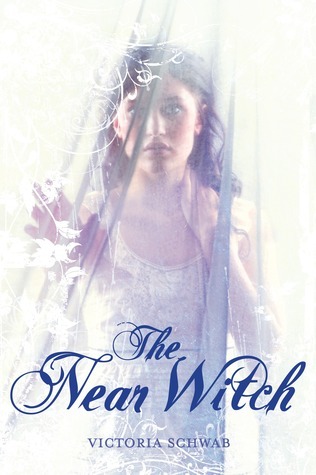 The Near Witch was an utterly enjoyable read and I cannot wait to read more from Schwab. I will have to reread this one as soon as I go pick up my own copy. It is delightful and spooky and magical. I just really loved it and I bet you, dear reader, will too. "It starts with a crack, a sputter, and a spark." "The world beyond unfolds. Five hills dues east and...I see it. The forest." 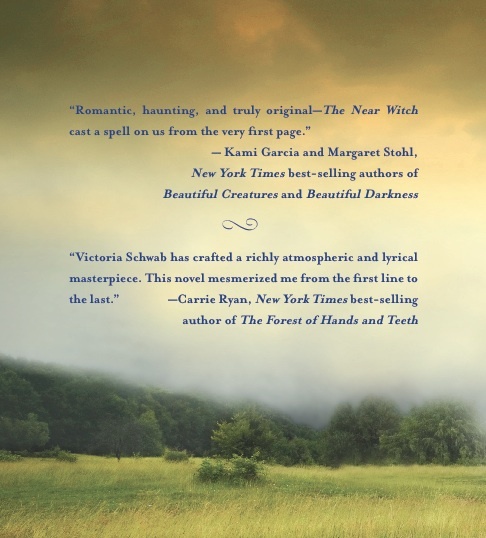 This is the back cover, that continues on the spine. There is too much color to go with the mostly white cover. Welcome to another stop for the second annual YASpooktacular, hosted by Frenzy of Noise and Wicked Awesome Books. This year, there are three stories written by some of your favorite authors that will be posted throughout the week. Each story is a choose your adventure, where you get to decide what path to send the character down. Sometimes you live, sometimes you die, and sometimes you fall into a pit of no return. 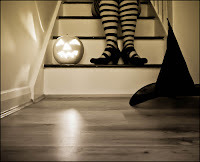 There are also some TRICKS or TREATS scattered throughout the story, where you can enter to win prizes and get bonus points toward the prize packs. The prize pack for Story 1 will be up tomorrow! On Halloween day, the grand prize pack will be posted. 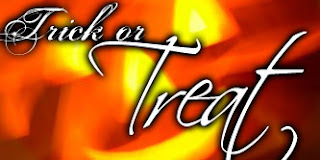 You can click the banner above to see a full list of the YASpooktacular prize packs! Laura felt her stomach roll, a sixth sense and too many horror movies telling her what was next. The way he said it, drawing out that word – partner – as if filled with delicious meaning, made her skin crawl and her brain scream NO FREAKING WAY! But she bit her tongue, her eyes dragged back to the rows and rows of captives. She shivered at the intimate quality of it. The collector reached a slimy arm through the bars, the shape whimpering, recoiling. “Come, my dear,” he said. “Show Laura your pretty face.” The girl inside pushed further back, uselessly trying to escape the webbed hand that stroked her bare leg. “I command it,” he said, his voice suddenly hard and threatening. Slowly, the girl inside lifted her head, staring beseechingly out. Her hair was matted, her skin pasty with untold time in this dark place. Except Laura knew exactly how long she’d been there. “Oh my God,” she gasped. “Jamie?” Laura took a tentative step closer, reaching for her sister. It had been almost two years, but her mom never stopped waiting and hoping. Laura couldn’t count how many nights she’d come down for water and found her mom sitting by the front windows, staring out into the dark. Laura forced her eyes down the endless line of cages, thoughts surfacing slowly in her overworked mind. Brian got away, killed his sister. I found a weapon, got the upper hand. She could feel the weight of the fireplace poker, comforting in her right hand. But first things first. Free them. Send Jamie home. Then beat the crap out of him. It. Whatever. Laura turned to the collector, trying to keep her face impassive. Trying not to scream at the way his eyes glittered when she said, “Deal.” She held out the poker. “Very well, my dear,” he said, sliding toward the wall to open a panel she hadn’t noticed in the dimness. There was an unsettling satisfaction in his voice, “As you wish.” A dark, knobby flipper-finger, pressed a single button. There was that grinding again, the scream of metal on stone as a hundred rusted doors swung open. Laura felt weak with relief. She’d been sure she’d screwed that up, losing the poker too soon, but he’d either not noticed or just meant his promise. Or been so eager to have his “partner”, her mind whispered. She pushed that aside, turning back to Jamie, hardly able to believe this day had come. An end to the agonizing uncertainty that was little by little draining the life from her mom. In a minute she’d be able to hug her big sister. If only they could go home together. In time. You’ll find a way out of this. Just free Jamie first. Laura watched as Jamie uncurled, slowly tentatively stretching out limbs that seemed not to have moved in weeks, months. Adrenaline rushed through her as all through the narrow hallway, arms and legs, then people - women, men, children – emerged gingerly. I did this! She glanced back at Jamie, then froze. Her sister’s lips seemed to be…disintegrating. Her snub nose – the one Laura had always envied - was too sharp and her brown eyes, dull and flat a moment ago, had taken on an eerie sheen. Glinting. Silver. Frantically Laura looked down the endless tunnel of captives, all of them changing - limbs shriveling, hair falling out, skin turning an odd jaundiced color. She stared, mute and horrified. “You seem…unwell. Laura.” The voice was just behind her shoulder, the low, wetness making her want to shriek. Before her, the thing-that-used-to-be-Jamie flapped pathetically, its arms now shrunken to nubs. Laura stared in horror. “And speaking of which,” he continued. “You weren’t much to look at when that boy brought you to me. 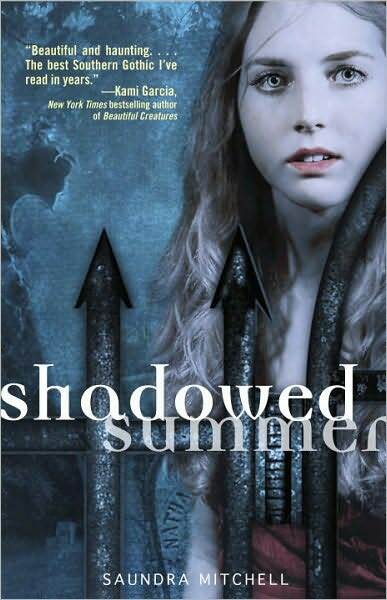 But now…” She felt his slimy touch, caressing her shoulder, turning her away from the cages, toward a picture. Of something horrid with bulging silver eyes and slippery orange skin, absurdly wearing a yellow coat. Just like hers. Laura brought a hand to her mouth, trying to stifle a scream. Only it wasn’t a hand. Not anymore. Jen Nadol grew up in Reading, Pennsylvania, hometown of Taylor Swift, John Updike and A.S. King. In high school, Jen liked to dye her hair, shop at thrift stores and listen to a lot of Depeche Mode, The Cure, and Erasure. She now lives north of NYC in an old farmhouse with her husband and three young sons. She still love thrift stores, listens to just about anything from Mozart to My Chemical Romance, and has way too many favorite books to name. Jen is the author of two books: The Mark and The Vision. Her third book, The Touch comes out in 2012. You can find Jen on Twitter, on her blog, on Goodreads and you can order her books here. For my treat I will be giving away a hardcover of Anna Dressed in Blood by Kendare Blake. Click Here to enter! Also make sure you stop by Tangled Up in Words tomorrow to enter for the Story 1 prize pack! Jesse cuts her own hair with a Swiss Army knife. She wears big green fisherman's boots. She's the founding (and only) member of NOLAW, the National Organization to Liberate All Weirdos. Emily wears sweaters with faux pearl buttons. She's vice president of the student council. She has a boyfriend. These two girls have nothing in common, except the passionate "private time" they share every Tuesday afternoon. Jesse wishes their relationship could be out in the open, but Emily feels she has too much to lose. When they find themselves on opposite sides of a heated school conflict, they each have to decide what's more important: what you believe in, or the one you love? Nuanced, fresh, and gorgeously well-written, Martha Schabas' extraordinary debut novel takes us inside the beauty and brutality of professional ballet, and the young women striving to make it in that world. Shy and introverted, and trapped between the hyper-sexualized world of her teenaged friends and her dysfunctional family, Georgia is only at ease when she's dancing. Fortunately, she's an unusually talented and promising dancer. When she is accepted into the notoriously exclusive Royal Ballet Academy--Canada's preeminent dance school--Georgia thinks she has made the perfect escape. In ballet, she finds the exhilarating control and power she lacks elsewhere in her life: physical, emotional and, increasingly, sexual. This dynamic is nowhere more obvious than in Georgia's relationship with Artistic Director Roderick Allen. As Roderick singles her out as a star and subjects her to increasingly vicious training, Georgia obsesses about becoming his perfect student, disciplined and sexless. But a disturbing incident with a stranger on the subway, coupled with her dawning recognition of the truth of her parents' unhappy marriage, causes her to radically reassess her ideas about physical boundaries--a reassessment that threatens both Roderick's future at the academy and Georgia's ambitions as a ballerina. So that's what I go this week, what did you all get? When Brody is attacked by a shark and loses a leg, she knows that life must go on. A year later she's living with her best friend and starting to have shark infested nightmares. Then, her ex-boyfriend rolls back into town. He crashes with them for awhile, but when disaster strikes, Brody decides it's time for him to go home. So she takes her mom's car and sets out on a road trip with her ex and her best friend. Firstly, might I say that this is the most adult of the MINX comics. There is a lot of crudeness and artistic appreciation of the female body. It was great. Brody's character was all over the place moody, she seemed to care little about losing her leg, which is nice, but little things seemed to set her over the edge. She was an intense character and might be a bit much for some readers. I liked how spunky she was and I loved the illustrations of her and Louisa. They were so realistic. Jake was a little flat, but meh he's a guy ;) I also enjoyed the subtle product placement of his other graphic novel Wet Moon (you'll have to read the book to find it yourself). 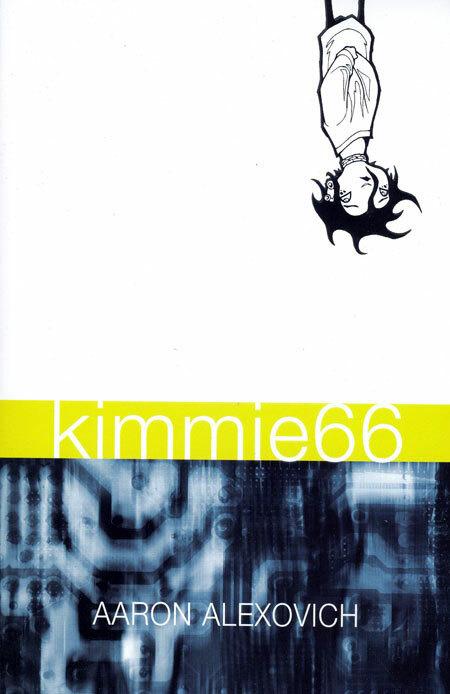 This was an interesting story of a fairly self-absorbed girl. I am not sure what age range these characters are. They act like they are fresh out of high school, but little things made me feel like they were supposed to still be in school. Chrissie seemed altogether far too young to be hanging out with them. 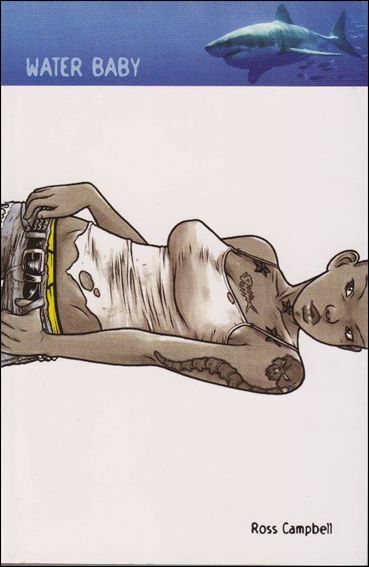 This was a tough chick book and if that's your style definitely check this one out. "I always have to pee right in the middle of a wave." "You're jus'...appendagely impaired, that's all." Tasha's mom does not have the best taste in men. Not only does Tasha know this, but all of her blog followers do to. There's also this tough girl at school who wants to kill Tash know that she has been picked for yearbook. And her mom's new beau has a daughter who's a little weird. Tasha's just trying to not be beaten up at school and live a normal life but when she overhears a moment between her mom's boyfriend and his daughter. Tasha knows she has to find out more and help Tasha if she can. Tasha is a little bit obnoxious, but not really too bad. I like the British-ness of the book, YAY England! ;) I was getting a little nervous about what could possibly be going on between father and daughter, and it turned out to be plenty weird. It was neat reading about a blogger, not that she blogs the same way but it was still fun. This story was a lot of fun and a lot of drama. It was totally worth the read and you should make sure you check this and all the other MINX books out soon. Happy Reading! "Tasha, are you out of your mind?" "They say a week can be a long time in politics. But some family holidays have been clocked with a time slippage of one to one thousand: that means each week feels like twenty year." Telly lives in the 23rd century. A time when virtual reality means virtual lives. Most people spend a good part of their time in Lairs, which are sort of like second life. Telly gets a suicide letter from her friend Kimmie, but she doesn't know if it's just a prank or not. The further she dives in the more she finds out. The more Telly begins to think that maybe you never really know your friends in the Lairs at all. Telly wants to help Kimmie, but it's going to take more minds than hers to figure out what is going on and save Kimmie from herself. This was a weird book. The whole idea of Lairs and the weird avatars people come up with is a bit much. I really cannot image no human interaction. Coil sort of bothered me he looked like a juggalo (ICP), and it made me not like him very much. Telly was also sort of an annoying character, because she seemed to stumble and mutter a lot and never really get anything out. I liked how intricate the story was though. Aaron Alexovich did a great job building this eerie world, and then the worlds inside the world too. It was a fast little mystery and a little spooky. If you're really into virtual reality and sci-fi this might be right up your alley. "I'm a reality check, poodlebuns." 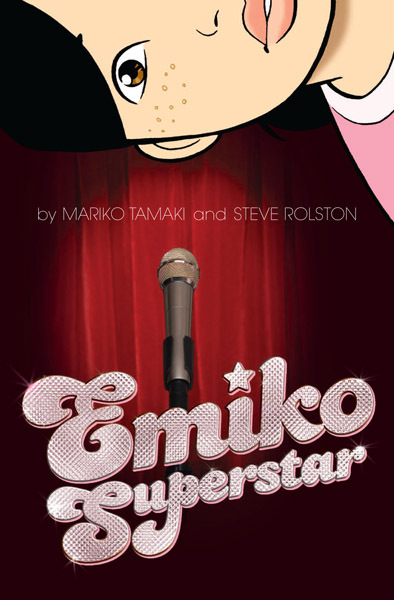 Emiko didn't start off as a superstar. She started off as just a girl with a summer job. Was a whip girl then a babysitter. This was before she saw Poppy in the mall. After that Emiko went to go see the Freaks and what a sight they were. She meets a guy named Henry that tells her she can fall in with that crowd to, if she only tries and wows. So she tries, because she wants to create something. 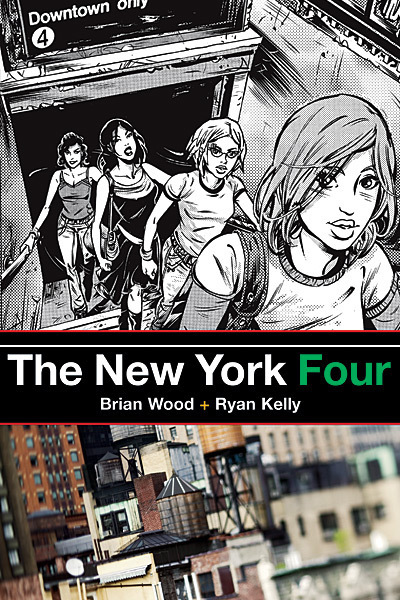 Emiko wants to find herself and the freaks might just help her. "Emiko Superstar. The more I think about it... ...the more I think this story should start with something about Andy Warhol." 1. So what is it like working on a graphic novel with another author? Working with Cecil was great. Our editor, Shelly Bond, set a positive, inclusive tone for us as a team. We would have regular conference calls to talk about the script and to look at the work I was drawing. And the result was a very high-energy, rewarding experience. It probably helped that Cecil wrote a great script. 2. Do you have an artist that greatly inspires you? Not really. I mean, there isn’t just one. I’m inspired by a lot of artists and sometimes it depends on my mood or what I’m working on, in terms of whose work inspires me. Some of my favorite cartoonists include Dan Clowes, Frank Miller, Robert Crumb. I also enjoy a lot of filmmakers like Wes Anderson, Spike Jonze, and Tarantino. 3. 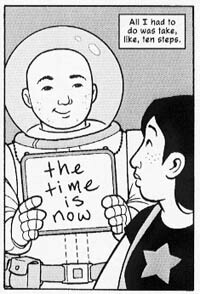 Do you have a favorite panel from either of the JANE books? 4. Do you have any books you're working on right now? Right now I am working on art for a solo show in LA next year, which will likely yield a book or zine or something. I’m going to be doing a fill-in issue on a DC book shortly, and have started blogging about some of my favorite fill-in issues of old comic books to motivate myself. And I’ve been doing a lot of short strips for anthologies like MOME and Smoke Signal and Pood. 5. Is there a book you've read recently that you can't recommend enough? Jaime Hernandez’s latest, the Love Bunglers, from Love and Rockets, volume 4, was one of the greatest comics I’ve ever read. I’m trying to remember what I’ve read recently, Outliers was a fun read. I’ve been looking at old Image books for a project I’m working on, and Jae Lee’s story from Youngblood: Strikefile 1-3 has surprised me. Tom Neely’s the Wolf is amazing. 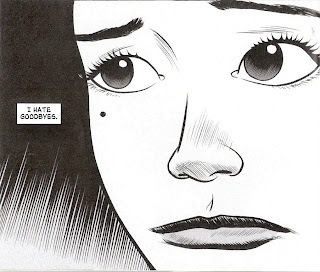 I read Felipe Smith’s Peepo Choo, a three volume manga from Vertical and absolutely loved it. 6. Anything else you'd like to share? The PLAIN Janes volume 1 returns to shelves this November. Volume 1 had sold out, and DC decided to reprint it. So that’s good. If anyone’s interested in the PLAIN Janes, it should be easy to track a copy down through their local comics shop, bookstore, or online. 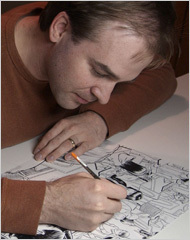 And anyone interested in keeping up with me can sign up for my newsletter, http://eepurl.com/fGTxc or follow me on Twitter, @jimrugg. Don't forget you can win a copy of The PLAIN Janes here and see my review here! After her dad leaves, Danni's mother drags her up to Oregon. Here her mother falls in love with an alcoholic and they move in. The man has a son, Haskell, and Danni and him share a room. He is very secretive and sneaks out every night. One night Danni follows him and finds out that he is the elusive ecoterrorist that the town has been trying to catch. She can believe in his cause in the beginning, but soon enough it might get to be too intense for her. Danni will have to try and decide the difference of fighting for a cause and just plan fighting. "Sometimes when I'm alone... ... I try to see how long I can stand it." "That blaze would be beautiful if it wasn't so terrible." Riley is shy and sheltered. She is also pretty obsessed with her smartphone. Online people are easy to talk to. When she starts going to college in Manhattan though, things start to change a little. For instance, she starts hanging out with her older sister. Riley hasn't seen her sister in ten years, not since she ran away from home. She also gets a crush on an online guy known as sneakerfreak. She's trying to keep up her grades, job and social life, and it's taking it's toll on her. She can't let her parents find out about her romance, but keeping it a secret might be tricky. Okay, first off Frank is super cute, even if he is a bit of a creeper. He seems pretty awesome, just wrong place at the wrong time. Riley does seem quite snotty and full of herself. She always interrupts people to answer her phone. That is super rude and I would have ditched her as a friend fast. She doesn't seem to even learn from the dirty looks everyone gives her, that she needs to start living in the here and now. I was a bit disappointed in the ending of this novel, because I don't see Riley grow at all. It seems that there was supposed to be a next book, and maybe she grows up then. Having the back drop of the big city was fun and I liked the way the novel was setup. There were little character bios every now and again, I liked that a lot. This was a neat story and there were some pretty interesting characters in it. I'm really disappointed that there is not a sequel right now, because some of the characters were up to some pretty shady stuff and I would love to know how all that pans out. "Is he really into sneakers?"